Last week we talked about increasing sales using Internet marketing, and today we aim to give you a crash course in the different types of Internet marketing. There are several different broad techniques that people easily confuse and they are distinctly different, and each have a different purpose. As more businesses turn to the Internet, traditional marketing methods are slowly dying and becoming ineffectual. Rightfully, business owners are trending to Internet marketing as a means of driving new sales. Yet, it seems, most are still confused about the basics of the different types of marketing out there. How are you meant to wisely spend your marketing budget if you don’t really understand the different types of Internet marketing? So here we give you a rundown of the broad terms in Internet marketing. Internet Marketing – is more of a generic term that outlines different marketing strategies through the Internet. Some of these are outlined below. Display Advertising – this is the most common form of Internet marketing that you’d already be familiar with. Display advertisements are the banner ads you see on most websites. These are good for raising brand awareness but aren’t very effective at generating sales. One method is to place your ads directly with an advertiser site (for example on the Sydney Morning Herald’s website). The other is through an advertising network like Google’s display advertising network where your ads are placed on websites that have vacant spaces (called “real estate”). Search Engine Optimisation (SEO) – may also generally be called “web marketing”. It is about optimising your website so it organically ranks better on Google when people search for products and services. People often confuse this with more proactive means of internet marketing or think that SEO is internet marketing, and thus miss the larger picture. SEO is very important but is a somewhat passive form of internet marketing strategy. Search Engine Advertising (SEM) – people often confuse this with SEO. SEM is about placing ads on Google search results (Google calls these Adwords). They typically appear above and to the right of the organic search results. These zones more likely to be clicked and hence are good for advertising when a consumer is ready to buy. You generally get a higher sales rate than display advertising with SEM. SEO is what may get you an organic search listing directly below the SEM ad placements. SEM is more proactive and targeted than SEO and more likely to generate you sales leads. Social Media – is about activating and maintaining your social network around your business through social Internet tools like Facebook, Twitter, Instagram, Pinterest and LinkedIn. A social media strategy can be used to maintain your client base, raise brand awareness but also to promote specials. Retargeting – this is a relatively new technology where your ads are specifically re-targeted to consumers as they continue to browse through the web after they’ve already interest in your business. Its quite clever. 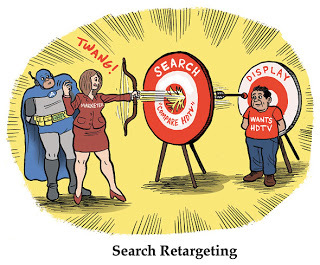 There are two main forms: Search retargeting, where your display ads are shown to people as they browse the web after they have searched for keywords relating to your business, and Site Retargeting, where your display ads are shown to people as they browse the web after they have visited your website. Both of these techniques help to continue to raise awareness of your business but also convert people browsing into genuine leads. While you may be tempted to dabble with Internet marketing you’ll typically only get lukewarm results because of the high competitive nature of the industry. It pays to talk to an expert so that you are making the best use of your marketing budget.